Do you want to set up the perfect home movie theater? The most essential element is a large sized TV where you can enjoy your favorite movies, sports, and shows. We know how difficult it is to make a decision about the best 80-inch or larger TV is, so we have meticulously tested a wide range of TVs which are 80 inches or more for you. If you are still not sure whether you need such a large sized TV, keep in mind that most of them are 4K and even better, so the clarity of the images and the color accuracy is stunning. Plus, most of the newest models have amazing smart features which will enhance your viewing experience immensely. Most of all – large TVs provide an incredible viewing experience which will allow you to be immersed in the scene and experience watching movies, TV, and sports or playing your favorite video games like you have never done before! The TVs on our best 80 inch TVs for 2019 contains our top choices when it comes to picture quality, performance, price, functionality and many other features combined. Please, read on to find the perfect large TV for your home or office, as well as the features to look for when choosing the best one to suit your needs and your budget. If you think you have seen it all when it comes to large sized TVs get set for a surprise. This year’s flagship TV from Sony will blow your mind! The black is blacker than ever, and the color and the shadows on this TV are absolutely realistic and to be honest – the best we have seen. Its more than 8 million pixels are self-illuminating and are very precisely controlled in real time by the TV’s X1 Extreme processor. As a result, you will be able to enjoy a contrast like you have never seen before as well as details which you have never believed existed in your favorite movies and sports games. This TV from Sony delivers a gorgeous 4K HDR picture which supports all HDR modes. Thanks to the Acoustic Surface technology, you will get the feeling that the words coming from the mouths of the characters on the screen are actually spoken to you in real time. You can easily set this TV up with Google Home or Amazon Alexa to make your viewing experience even better and easier to control. Of course, given the 82 inch diagonal of its TRILUMINOS display size, you can expect that this TV has quite sizeable dimensions. Without the stand, it is 75 ¼ x 43 ¼ x 2 7/8 inches, and with the stand, it is 75 ¼ x 46 3/8 x 15 5/8 inches. But then again, this TV is very slim and looks absolutely gorgeous from all sides. It features a variety of inputs to connect multiple sources, consoles and other devices, including 4 HDMI, a composite port, 2 USB 2.0 and 1 USB 3.0 ports. You should take advantage of the free tech support offered for the first 60 days after the purchase of this TV, in order to get help to set it up, connect, configure or troubleshoot it until you get the perfect result which you expect from the Sony XBR85X900F. Along with the TV itself, you will receive a voice remote, IR blaster, batteries, a stand, a power cord, and a useful setup guide and user manual. Thanks to its voice remote control and its compatibility with Alexa and Google Home, changing the channel, picking a movie, or checking a score will become easier than ever. Also, you can enjoy a wide variety of Android apps on this TV including Netflix, YouTube, Hulu, Amazon Video, Pandora and many more. Even if you are not sure where to find your favorite movie or video, just ask the built-in Google Assistant, and it will find the content for you. Even if you are not watching a Blu-ray movie, you don’t have to worry about the quality of the image, because Sony has incorporated several technologies which will automatically improve the quality for you – the Super Bit Mapping 4K HDR, the Object-based HDR remaster and Dual database processing. Thanks to the Dynamic Range Pro 6x, all dark scenes will be darker, and the bright scenes will be six times brighter than in other TVs. The X-Motion Clarity feature will ensure that fast action stays clear, smooth and without blurring when you are watching an action movie or sports. This is a perfect extra large TV if you love watching sports, action movies and playing video games, or if you want to watch anything with the colors and details as close as those you will see in real life, as it provides a smooth, detailed fast-action performance with a wide contrast range and superior brightness. If you want a large and yet relatively affordable TV, then check out the Samsung UN82MU8000 TV. It is 82 inches and supports an Ultra HD or 4k resolution. This TV also provides an astonishingly realistic and life picture quality thanks to the 4K Color drive extreme feature which provide a picture better than a conventional 4k UHD TV. It can be voice controlled or controlled via the included Samsung Remote Controller OneRemote. The One remote can actually control all of your devices, which means fewer remotes and less fiddling to find the one you need. The One Connects mini is a very useful feature which allows you to easily access all of the ports and connections without having to access the back of the TV every time you need to plug in or out a device. Thanks to the Clean Cable Solution, you will be able to set this TV up along with all other connected devices, consoles, and others without having to deal with tangled and unsightly cables all around it, by incorporating them in the stand of the TV. With the amazingly fast 240 Hz refresh rate of this TV from Samsung, you can enjoy all your favorite sports and fast action movies or shows without any blurring, lagging or without a loss of clarity and detail. In fact, you get a theater-like experience with this 82-inch TV. Thanks to the Samsung Smart Hub, you can easily access and enjoy your favorite channels, sports, shows , nd apps on Netflix, Apple TV, Hulu or others. This large Samsung TV has multiple ports to connect your video game console, computer or any other chosen device, including 4 HDMI, 3 USB, 1 Ethernet, 1 Digital Audio output, 1 RF input and an RS232C serial interface. It has integrated Wi-Fi so you can easily connect it to your home network for easy access to your media files, photos and on the Internet. 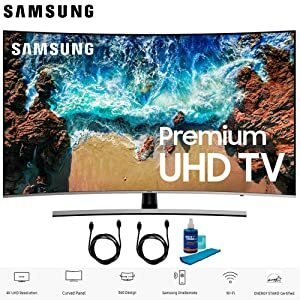 Overall, this is an excellent and affordable large sized Ultra HD TV from Samsung, which we strongly recommend for those of you who want to enjoy a large screen TV without breaking the bank and without compromising on the quality provided at the same time! If you are ready to splurge out on a new huge and incredible TV, then we suggest you choose the Samsung QN88Q9FAMFXZA. It has an enormous 88 inch LED backlit LCD display and provides 4 times the resolution of 1080p. This is an HDR UHD QLED TV with smart features and a highly efficient Motion Rate 240 Hz technology which helps enhance fast-moving images like sports, action movies, and others in order to remove any blur and improve the accuracy of the picture. The built-in Wi-Fi connectivity will allow you to quickly and easily access any of your favorite apps or Internet content via the Samsung Smart Hub and allows screen mirroring and content sharing with your smartphone or other smart devices. The One Connect box will house all of the connections of the TV so you can access any of the ports or connections without having to struggle to reach to the back of the TV. You can connect your Blu-ray, DVD, game console or any other chosen device this TV via the wide range of ports and connection options, including 4 HDMI, 3 USB and serial. The Elite Black+ with Infinite Array feature improves the contrast of the picture and allows you to enjoy incredibly realistic actions and images at all times, no matter the source. The design of this TV is stunning thanks to it no bezel design. It looks great from all sides, and you can easily watch on a stand or mount it on the wall like a picture thanks to the Samsung No-Gap wall mount feature. It is 77.9 x 44.5 x 1.2 inches, so make sure you have sufficient space for this monster of a TV. Thanks to the Every View design of this TV, you will get a perfect view of the screen wherever you choose to sit. Your new large-sized TV will provide you with an unforgettable viewing or gaming experience thanks to the 100% color volume and more than a billion colors thanks to the new Quantum Dots technology. The blacks are truly black and the Q contrast will make you feel like you have stepped into the movie, game or show you are watching. The set is powered by a powerful quad-core processor for fast control and a fluid browsing experience. The Dolby Digital Plus will optimize your viewing or gaming experience by providing realistic and enhanced sound. The Samsung Smart Remote can be used to access all of your other smart devices apart from the TV which means you will only need one remote control from now on. This is the largest flagship TV from Samsung which is quite costly, but given the incredible quality of the picture, the stunning design and all of the amazing smart features, it is an amazing appliance to add to any home or office! If you still are not sure about the large-sized TV you want to buy, then browse through our remaining 7 choices from our list of the best 80-inch TVs for 2019 to find out more about the other incredible TV sets we picked out for all of you fans of the ultimate TV viewing experience. This is another beautiful large TV from Samsung which we have gladly added to our list of the best 80-inch TVs for 2019 for a wide array of reasons which we will summarize for you. This is a very stylish TV set which will look like a picture on your wall, thanks to the modern bezel-less design. The picture and colors are vivid and lifelike, and you will be able to enjoy your great 82 inch TV even when you are not watching anything or playing a game thanks to the neat Ambient Mode. We all agree that the Samsung QN82Q6 is an excellent large screened TV for any home or workspace. For those of you who want a 100 inch TV, the Hisense 4k UHD Laser TV is definitely a top recommended choice. Although it is not really a conventional TV, this system will provide you with the ultimate home movie theater experience! We love this projection system, and it is the best option for those of you who want a really large and top quality projection screen with a powerful audio system and an easy to set and use a projector for your home theater, office or other space. This is the best TV to get if you want a large screen TV with true local dimming which won’t hurt your wallet. This 85 inch Samsung TV is a gorgeous looking TV which has all the features you are looking for in a large-sized TV and is not as expensive as some of the higher end models in our list. We love the quality of the picture, the smart functions and the added features which this model come with. This is one of our favorite high-end large-sized TVs for 2019, and there are so many reasons for this. We have created a list of the pros and cons to let you know what to expect from the Sharp LC-80LE757 Aquos Quattron TV. Although it is not a 4k TV, this large TV from Sharp will provide you with a perfect picture no matter what you are watching. It has a wide variety of smart and picture enhancement functions to make your viewing or gaming experience unforgettable. If you are ready to compromise 3 inches from the diagonal and go for a 77 inch TV instead of an 80 inch one, we strongly recommend this one from LG. The LG OLED77C8PUA TV may be “only” 77 inches, but it will compensate the size with the amazing 4k OLED TV viewing experience it provides. It has one of the most powerful processors around, and the sound of this TV is probably the best one we have heard in a long time. If you want a large screen TV which will provide you with perfect lifelike details, colors, contrasts, and clarity, check out the Sony XBR77A1E. Yes, the Sony XBR77A1E maybe 77 inches and not 80” but it is a wonderful large screen OLED TV which will bring beauty to every home or working space, and will ensure that you enjoy every minute of your viewing or gaming time, every time – no matter what. This is the largest and most expensive of all of our top picks, but its impressive 98 inches and amazing picture are absolutely worth every penny if you want to enjoy watching your favorite shows or sports on a remarkable screen. This 98 inch LG TV is the ultimate large TV for all of you who want to be immersed into their favorite sports game, show or film. It has an array of incredible features which will change your entire perception of viewing video or playing games. Since buying an 80-inch TV is quite a large investment, it is especially important to take the time to look for the one which offers the best quality and value for the price asked. Here are the main features to look for and consider when shopping for a large TV sized 80 inches or more. All of the large TVs on out top 10 list have smart functionality. This allows you to connect to the Internet and to other smart devices and access and view videos and content form Netflix, Hulu, Amazon Prime, YouTube, Apple TV, Google Cast and others. You can also download and play games on the TV and use a wide range of apps. The TVs on our list feature various smart TV platforms including Samsung’s Tizen, LG’s WebOS and Sony Android TV. The best Smart TV platforms will allow you to customize your settings, voice search, access to app menus, gesture control and full web browsing. The resolution of the TV is always important, but given the large screen size of these TVs makes it especially important if you want superb picture quality on your large screen. 4K UHD provides a picture quality which is four times better than a Full HD resolution thanks to its more than 8.2 million pixels. Also features like HDR will add even more precision, brightness, contrast, and depth to the color. At the same time, the motion blur is lower, which makes watching fast moving actions and sports much more enjoyable on such a large screen. LCD screens are the oldest types and can rarely be seen in newer TVs. LED screens are the most popular types of screens which many of our TVs on the list have. The more advanced and expensive OLED screens provide the best pictures and the widest viewing angles of all. The thickness of the TV and the bezels also vary. Some of the models we have picked for you are without bezels and are ultra-thin for a better viewing experience and for better aesthetics. Most of our choices come with table stands but have the option for wall mounting. Models like the Samsung Electronics QN88Q9FAMFXZA which has a no-gap feature allowing placing it on the wall like a picture. You may want to choose a TV which provides a wide viewing angle, and which looks great from all sides like the Sony XBR85X900F. All of the large TVs on our list have at least 2 HDMI inputs, as well as USB and other connectivity options. HDMI connectivity is essential for a 4K picture quality from sources such as Blu-ray, set-top boxes, consoles, and other sources. Newer TVs have HDR compatible HDMI 2.0a connectivity options. Of course, if you enjoy streaming content, it is essential that the TV has internet connectivity, such as an Ethernet connection as well as Wi-Fi so that you can connect your large TV to your home network for easy access to your media files and so that you can share and mirror images and media files from your smartphone and devices. Look for a TV with at least 15 to 20 Mbps Ethernet connectivity if you want to watch 4K streaming smoothly from sources, like Netflix, YouTube, Hulu, and others. USB connectivity will allow you to watch 4K media from flash drive external hard discs and to connect an array of other devices to the TV for added versatility. The TVs we have selected for you offer an enhanced color level, a higher dynamic range and much superior motion control than regular Full HD TVs. This is essential if you want perfect quality viewing with no blur with higher contrast, deep black, and vivid lifelike colors no matter what you are watching. Most of the TVs on our list offer excellent upscaling which will allow the non 4k content from different sources to be reprocessed into a 4k quality one. This is essential because most content broadcasted or streamed today is not delivered in 4k quality. High Dynamic Range is another feature you should look for when buying a TV which is 80 inches or larger. All of our choices have HDR, and some support all types of HDR, like the LG Electronics OLED77C8PUA OLED TV and our best pick – the Sony XBR85X900Ffrom our top 10 list. All large 4K TVs have display illumination. Local dimming is essential for illuminating dark sections of the screen. OLED TVs are the leaders in this area thanks to the pixel perfect precision illuminating technologies. Picking the size of your large TV is important to protect your eyesight and for the best viewing experience. A rule of the thumb is to choose a size which allows you to watch it at a minimum distance of three times the height of the screen for HD TVs and 1.5 times the height of 4K UHD screens. Of course, you should pick a TV which will fit the space you have allocated for it on your TV stand, table, cabinet or wall. So, it is logical to pick the size of your large TV depending on whether you are going to be using it in a large home movie theater or in a small sized living room. The higher the refresh rate of your big TV – the better the quality of the picture will be when you are watching fast action movies and videos or sport. Opt for a TV with a refresh rate of at least 120 Hz. All of our picks have fast refresh rates, some of them reaching 240 Hz. Out top pick from Sony has an X-Motion clarity refresh rate which makes it perfect for watching your favorite sports and movies. Take a look at the contrast ratio of the TV before buying it. It is a matter of preference, so it is a good idea to test the TV with your own eye and with your own content before buying it so that you will be sure that you will be happy with the contrast levels of your new large TV. We have picked flat TVs for you because they can be mounted on walls and are easier to accommodate than curved screens. Also, the latest and best 80 inch and larger TVs are all with flat screens because there is virtually no benefit of utilizing curved screens apart from the style of the TV. The quality of the picture is not affected by the curved design whatsoever. Let’s hope that we have helped you choose the best 80 inch TV for your needs and taste. A good quality 4K large sized TV will change your entire viewing experience. A TV with an 8- inch screen or larger will immerse you in the content being viewed. You will feel like you are part of the action on the screen no matter what you are watching. The TVs on our top 10 list will all provide you with an unbelievably detailed, real-life picture which is unmatched in quality, color range, black levels, contrast, shadowing and non-blur fast action viewing. We have picked models from a lower price range and some higher-end options so that you can choose the one which best fits your budget. Whichever one you choose, you cannot go wrong, but still, take the time to compare the features we have listed and find the one which is the best buy for the money you are planning to spend. Choose the TV which has everything you will need for the perfect viewing experience, as well as a TV from a reputable manufacturer and brand because the investment you will be making is a serious one, no matter which model from our list you will choose. You want to make the wisest possible investment by buying the best 8- inch or larger TV for your money, right? Good luck with your purchase, and get ready to sit back and enjoy your favorite movies, sports and shows like you have never experienced before with one of these superb quality large screen TVs!